The only item of radio equipment in my Christmas stocking this year was a Tecsun PL-360 FM/MW/SW DSP receiver. These smartly-styled radios in black or silver are widely available on eBay for less than £30 including postage from China. The radio looks and feels a much better quality item than you might expect at that price. The PL-360 covers medium wave, Band 2 FM (with stereo decoder) and 13 short wave bands from 2300 to 21950 kHz. 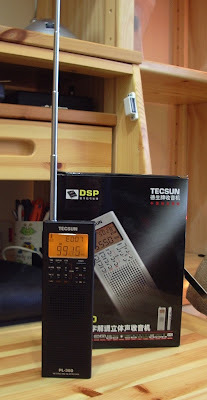 Unlike most cheap short wave radios that have a frequency counter displaying the frequency of an analogue VFO, the Tecsun PL-360 is a true digital radio having a fully synthesized PLL VFO. The Tecsun is also a digital radio in that it is DSP based not the usual superhet. The benefits are immediately apparent when you listen to the radio - it has that clear, open sound characteristic of DSP receivers. The internal speaker does not deliver much bass but you really hear the difference, especially listening to FM stereo, when using earphones, of which a Walkman-style pair are included. For AM use Tecsun supplies a rotatable ferrite rod antenna that plugs in to the top of the radio. This can be used over a frequency range of 150 to 1710 kHZ, though note well that this radio does not have a long wave band. The 7-section telescopic whip antenna is 38cm (15in) long and is used on the short wave and FM bands. The tuning control is a click-stopped rotary encoder which tunes the radio in 1 kHz steps on short wave and 9 or 10 kHz steps on medium wave. The radio can be tuned outside the broadcast bands but this is rather a tedious exercise due to the 1 kHz steps - there is no provision for direct frequency entry using a keypad. 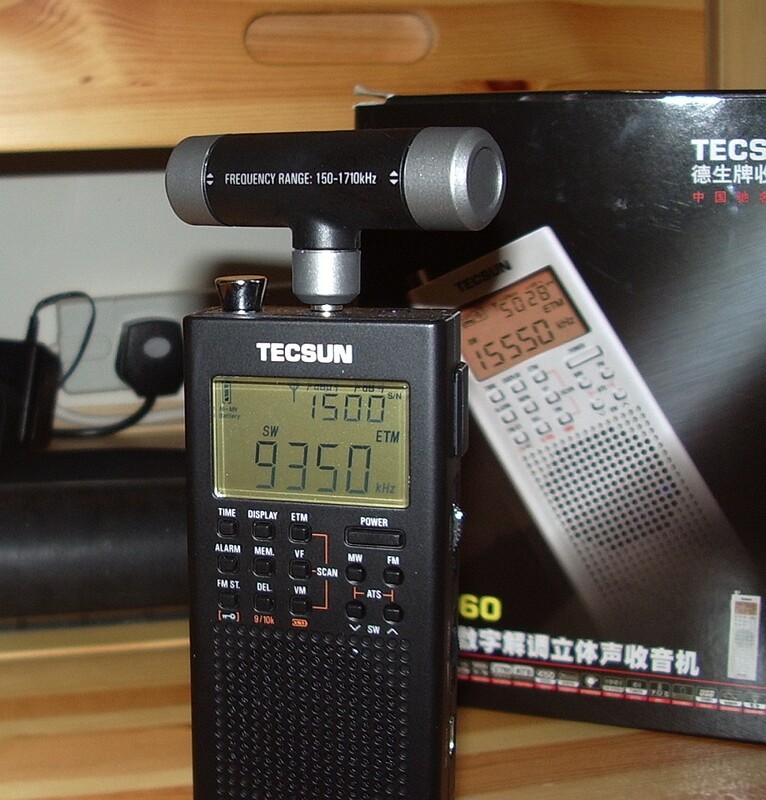 The Tecsun PL-360 does not demodulate CW or SSB so there is not much point in tuning into the amateur HF bands - a pity, though that is not unexpected at this price level. For tuning the Tecsun has a neat trick inherited from TV receivers. Called Easy Tuning Mode (ETM) the radio first tunes the entire MW, SW or FM frequency range and stores all the frequencies on which a signal was heard in memory. You can then tune from one signal to the next using the click-stopped tuning control. This makes short wave listening really easy and pleasurable. Doing an ETM scan of the short wave bands takes a few minutes. The feature is a useful tool for checking out HF propagation, though it's a pity the tuning range stops at 22 MHz. Power is provided by 3 x AA cells which may be standard alkaline or NiMH rechargeable (not supplied.). A charging circuit is built-in and power may be applied using a mini-USB socket on the side, so you can charge the batteries from a PC (using an appropriate USB cable) or a mobile phone charger. A charger is not included, but you do get a long wire antenna that clips on to the top of the telescopic whip for improved short wave reception, and a nice faux-leather case. As an alternative to the Easy Tuning Mode the receiver may be tuned manually and frequencies entered into memories, but as mentioned earlier this is quite tedious. There is no programming software that would enable memories to be set up using a computer. There is a built-in clock which is quite accurate and includes an alarm function. The radio also has a temperature sensor and displays both temperature and time even when switched off. To sum up, the Tecsun PL-360 is a portable radio of surprisingly good quality and performance for the money. Its Easy Tuning Mode makes casual listening a pleasure, the audio quality is excellent and the provision for rechargeable batteries is welcome. At less than £30 it is a real bargain. It was a seller called qpstore-lighting. But if you go there now it says the item is no longer available.